In December 2002, the U.S. Geological Survey published a map of groundwater declines in the Albuquerque basin of central New Mexico. For those who live in the rapidly urbanizing Middle Rio Grande corridor, the maps message is not good: Several severe cones of depression are evident in the prime Santa Fe Group aquifer, from which more than half a million people get their drinking water. The deepest wound lies beneath eastern Albuquerque; two others mark the citys developing western side and the rival metropolis Rio Rancho on the high ground to the north. Stark contrast marks the edge of the Rio Grande floodplain south of Los Lunas, N.M., where irrigated farmland meets arid high ground that is awaiting development, with an uncertain future. Photo by Peter Hebard. Those bulls eyes in the water table have relevance for river basins throughout the arid Southwest, where surface flow and groundwater often maintain a tenuous but vital connection. Understanding that link is crucial to resolving future water conflicts in the region. The Rio Grande splits New Mexico roughly in half. Midway on its journey from the southern Rockies to the Gulf of Mexico, the river flows through a series of basins known as the Rio Grande Rift, a 30-million-year-old stretch mark in the planets crust. Thanks to the work of water, this great rift has slowly filled with layers of gravel, sand and clay. In some places, the deposited sediment is 15,000 feet thick. Scientists once believed that the Albuquerque basin housed a subterranean Lake Superior. In the late 1990s, however, geologists learned that complex faulting, volcanic intrusions and layers of clay isolate portions of the aquifer and limit their interaction with the surface. These amputated deposits of archaic water are finite and irreplaceable, meaning the basin contains much less high-quality groundwater than was originally supposed. Moreover, booming municipalities such as Albuquerque and Rio Rancho currently derive all of their drinking water from the ground, and are pumping it out faster than rain and runoff can replenish it. For the river, tasked with serving all thirsts, and for everything that relies on the residual Rio Grande, a calamity is in the making. Across the West, two rules have prevailed for more than a century: Whoever claimed the water first has priority in times of shortage, and water must be put to beneficial use or the right to it is forfeited. In the Rio Grande valley  the oldest continuously irrigated region in North America  the earliest rights belong to Native American pueblos and tribes that lived along the river and its tributaries before the arrival of Europeans around 1600. Second in seniority are rights derived from New Mexicos Spanish colonial time. About a thousand community ditches built by Hispanic settlers are still in use, and many others have been superseded by modern conveyance systems based, in part, on old water rights. The federal government recognized these rights by treaty in 1848. New Mexicos territorial government did likewise in 1907, when senior status was granted to all existing water uses. After 1907, appropriations of surface water required a permit from the state, and priority was established according to the application date. Most of the rights belonging to municipalities fall into this junior category. The state has legally acknowledged the connection between surface flow and groundwater. Where potential exists for groundwater pumping to deplete a stream system, the state may prohibit or limit groundwater withdrawals; it did exactly that in the Albuquerque basin in 1956. Surface rights must be purchased and retired in exchange for what is pumped from the new well. The rule applies only to large wells; domestic wells are considered de minimus depletions of groundwater and are exempt from the offset requirement, despite the fact that several thousand additional permits are issued by the state every year. The cumulative impact of domestic wells on the system may be anything but ancillary: No one knows how many are in use in the basin, or how much water they extract, because metering is not compulsory. Additionally, the Rio Grande is subject to an interstate compact that apportions annual flow between the states of Colorado, New Mexico and Texas, as well as an international treaty that allocates 60,000 acre-feet (more than 19 billion gallons) of water to Mexico every year. After nearly a century, these arrangements seem inherently flawed. The rights of Native Americans were recognized but not delineated, and no water was set aside for river ecosystems. Yet today, federal laws, such as the Clean Water Act and the Endangered Species Act, require minimum flows for the dilution of treated wastewater and for species habitat, leaving management agencies and water rights holders to try and meet the mandates. Thanks to yet another interstate agreement, however, the Rio Grande has had the benefit of a cushion for the past 30 years. New Mexico is entitled to a little over 11 percent of the flow of the upper Colorado River because a tributary, the San Juan River, loops through the northwestern corner of the state. Beginning in 1972, up to 96,000 acre-feet (about 31 billion gallons) of San Juan water has been re-routed into the Rio Grande basin via tunnels blasted through the Continental Divide by the U.S. Bureau of Reclamation. Specific amounts of the imported supply are contracted to the city of Albuquerque, to the Middle Rio Grande Conservancy District for irrigators in the middle valley, and to numerous other entities. Through the marvel of engineering, one drainage basin is now dependent upon water requisitioned from another. In the late 1990s, hydrologists generated a budget of inflows and outflows to aid water planners in the Middle Rio Grande. The reckoning calculated that in spite of combined native and imported flows, the region is racking up a deficit of between 55,000 and 70,000 acre-feet a year. Three things have allowed the region to carry such a debt without running afoul of the Rio Grande Compact. First, there have been annual transfusions of water from the San Juan. Second, municipalities have been pumping ancient groundwater from the basin aquifer and returning half of it to the river as treated discharge. Third, the past 20 years have not been average in terms of precipitation; they are among the wettest on record in the desert Southwest. Metropolitan growth has piggybacked on these three windfalls, but now events are conspiring to call in the regions overdue loans. New Mexico appears to be entering a phase of long-term drought. Climatological research, archaeological evidence and tree ring data from the past several millennia all testify to cycles of severe aridity in the southwestern United States, lasting anywhere from a couple of decades to hundreds of years. Were such conditions to occur today, they would equally affect water supplies in the Rio Grande drainage basin and in the neighboring San Juan River basin. Yet development is accelerating in the river corridor, and municipalities are scrambling to find water to meet projected future demand. Albuquerque plans for direct use of its San Juan allocation for municipal consumption. In order to reduce reliance on the aquifer, the city hopes to divert as much as 103,000 acre-feet of water a year from a 17-mile stretch of the Rio Grande. Although the city would return half that amount to the river downstream, the diversion would greatly diminish flows in the reach where the worst drawdowns occur in the water table. The city employed a flow model, developed by contractors, to assess project impacts indicates that even if groundwater pumping were to cease completely, the aquifer would not be able to recover within 60 years. Meanwhile, without some curb on growth, the city will again exhaust the water rights it owns and resume full-time groundwater mining, perhaps in as little as two decades. Conventional thinking advocates funding urban expansion with water derived from agriculture. Through advanced methods of water conservation and application, and through the attrition of farmland, water is freed up and reallocated to the highest and best use, which is assumed to be residential and commercial development. But, a different future may be unfolding. Where dams and leveed channels have regulated and contained rivers and streams, irrigation preserves the vital link between surface flow and aquifer. Irrigation in the Albuquerque basin offers a good example of such artificial connection. According to a 1997 Bureau of Reclamation study, 50 percent of groundwater recharge occurs through flood irrigation and seepage from canals and drains that parallel the river. But concentrated aquifer pumping, urban sprawl across upland recharge zones, and the simultaneous retirement of irrigated bottomlands are drying out the basin sponge; once dry, it may be impossible to resaturate. In the Middle Rio Grande, the attrition of irrigated land is at work with an added twist. Acre by acre, as water rights are transferred from farms on the valley floor, suburban homes are built on the retired land. Most draw water from private wells, sucking from the ground (and thus from the river) the same amount of water sold off as surface rights to supply development elsewhere. Equally damaging, the state has been granting pumping permits to developers on the condition that offset rights will be obtained from an unspecified source at some unspecified time in the future. Together these two policies have resulted in a gross over-appropriation of the Rio Grande. Former State Engineer Thomas C. Turney has estimated that paper claims outstrip wet water in the basin by a factor of four to one. In a stream system where more uses are being approved than can actually be served, those who hold unquantified senior rights have plenty to fear. New Mexico law insists that the state apportion water according to priority in times of shortage, but determining entitlements is a slow, expensive and contentious process, and most of the states Native American and early agricultural rights have not been adjudicated. In the meantime, powerful development and municipal interests continue to lobby for political decisions based solely on economics, and state officials hint that in the future, there may be no such thing as senior rights. Everyone, they say, will simply have to share. That approach threatens both treaty promises and compact obligations. It also fails to acknowledge the combined effects of long-term drought, ever-increasing numbers of water users, and a river taken hostage by its aquifer. Given such impending circumstances, the future may well consist of a panorama of abandoned subdivisions above a dusty floodplain. Arranged in a semicircle around Rio Rancho and Albuquerque are four Indian pueblos: Zia (see sidebar), Santa Ana, Sandia and Isleta. Sandia and Isleta bracket the area of greatest aquifer decline. And while Albuquerques pavement and concrete obscure the geology of piedmont slope and floodplain, the adjacent pueblos constitute a partial preserve of natural drainage and recharge. They offer the only places in the urban corridor where ribbons of undeveloped land stretch from mountain front to river. The immense value of those intact watersheds has yet to be recognized. With tribal rights unquantified, and junior users proliferating all around them, Sandia, Isleta and Santa Ana are each developing commercial and recreational complexes, including resorts, casinos, golf courses and soccer fields. The volume of water required to maintain such facilities in the high desert raises ethical issues, but the pueblos are simply putting quantities of water to use as a hedge against otherwise certain loss. Fortunately, tribes are also starting to explore more system-friendly options. All three of the urban corridor pueblos are involved in river restoration efforts and endangered species recovery programs that depend primarily on improving hydrologic function. Projects to enhance overbank flooding, revive river channel dynamics, reestablish wetlands, remove non-native vegetation and assure watershed health, through better forest and range management, could someday become more economically rewarding than development that encroaches on a tapped environment and historic water rights. If so, hydrologic guardianship of the Middle Rio Grande may not be far behind. The Pueblo of Zia, which has occupied its present site on the Jemez River since around A.D. 1200, is devoted to preserving its heritage. Its menfolk still hunt to fill family freezers with deer, elk and turkey. Feast day dances are respectfully performed. Most residents practice at least one traditional craft, and a tribal project to perpetuate the native language has been underway for some years. There will never be a casino at Zia, says Governor Peter Pino, who served as tribal administrator for 31 years before accepting the governorship of the pueblo last December. One of the states most proactive tribal leaders, Pino has been instrumental in helping his pueblo choose a responsible path, particularly regarding water. Zias efforts to make modern economic decisions that have minimum impacts to the environment may have begun in 1977, when the tribe acquired White Mesa, a striking outcrop of Todilto limestone southwest of the pueblo that was being mined for gypsum. Today, gypsum is still being extracted and processed at a plant in nearby Bernalillo, but Zias lease agreement calls for reject sheetrock and wallboard to be returned to the extraction area, to be recycled by the elements. Waters scarcity and sacredness is at the heart of Zia life. With the ephemeral Rio Jemez on their doorstep, tribal elders pay close attention to the natural hydrologic cycle, trekking into the mountains each spring to assess the snowpack and authorizing a corresponding number of pueblo croplands to be planted for the coming growing season. In wet and dry years alike, water is strictly rationed  Zia permits no landscaping, groundwater is used only for household needs, and trucks and cars wear proud coats of dust. Since 1983, a water rights adjudication suit has been underway in the Jemez basin. Although the process is seldom conducive to neighborliness, when drought threatened the drainages residents in 1996, Pino and the leaders of five upstream agricultural communities pioneered a shortage sharing agreement based on an early precedent involving Zia and the Village of San Ysidro. The current pact, officially adopted as part of the ongoing adjudication, recognizes the senior water rights of both Zia and the Pueblo of Jemez, but outlines a series of schedules whereby wet water may be amicably distributed to junior users of the Rio Jemez. In the arena of regional water planning, which the New Mexico legislature mandated in 1997, Zias voice has also been heard. In the only state with no legal protection for instream flow, the first principle of the Rio Puerco/Rio Jemez subregional plan honors the pueblos spiritual need to leave a little water in the river. But conflicts over that limited resource are far from settled, and once again, Zia is on the front line. 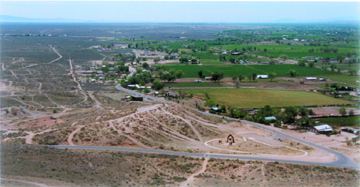 Just across U.S. Highway 550 is the creeping edge of Rio Rancho, one of the fastest growing cities in the Southwest. In order to pump additional groundwater to serve its teeming newcomers, Rio Rancho must acquire and retire surface water rights (see main story). Aware that any reduction in irrigated land could negatively affect the flow of the Jemez, Zia filed a lone protest of Rio Ranchos proposed transfer of 124 acres of agricultural water rights from the Village of San Ysidro, six miles upstream from the pueblo. The protest seeks to remind municipal and state administrators that the 1996 agreement between Jemez basin pueblos and non-Indian irrigators still stands, and that any rural/urban water transfers will be subject to the terms of the shortage sharing schedule. Zias challenges frame a major dilemma for the modern Southwest: a choice between a future driven by rampant growth or by an obligation to hydrologic reality. A lifelong resident of the Middle Rio Grande, Robert is a freelance writer who has concentrated exclusively on water issues for the past 17 years. She is the former editor of the New Mexico Water Dialogue and currently publishes a newsletter for constituents of the Middle Rio Grande Conservancy District. She is also sole indentured servant to a 5-acre farm near Tomé, in the floodplain of the Rio Grande. Bauer, Paul W., Richard P. Lozinsky, Carol J. Condie, and L. Greer Price. 2003. Albuquerque: A Guide to Its Geology and Culture. Scenic Trip Series, No. 18. New Mexico Bureau of Geology & Mineral Resources, Socorro, N.M.
Bexfield, Laura M. and Scott K. Anderholm. (2002) Estimated Water-Level Declines in the Santa Fe Group Aquifer System in the Albuquerque Area, Central New Mexico, Predevelopment to 2002. U.S. Geological Survey Water Resources Investigations Report 02-4233. Briggs, Mark K. 1996. Riparian Ecosystem Recovery in Arid Lands: Strategies and References. University of Arizona Press, Tucson, Ariz.
Johnson, Peggy S., Editor. 2003. Water, Watersheds, and Land Use in New Mexico: Impacts of Population Growth on Natural Resources. New Mexico Decision-Makers Field Guide No. 1. New Mexico Bureau of Mines and Mineral Resources, Socorro, N.M.
Postel, Sandra and Brian Richter. 2003. Rivers for Life; Managing Water for People and Nature. Island Press, Washington, D.C.